Time flies and my trip back home is sadly over. As years go by, it’s more difficult to be far away from my friends and family, probably because as you grow older, you realize what the essential in a lifetime is. The good thing is that I am back to San Francisco with lots of new ideas. My layover this time was over 4 hours in beautiful Island. The airport is small but the quality of the stores is amazing as everything else in Island. I have used all my fancy Islandic salts from my previous trip, and lucky me, they had more for sale at the airport. This time I bought some grey lava salt with Islandic herbs. I am still on my vegan diet and experiments and I love it. Even though France has a history and a culture of meat eaters, over the years it’s easier to find more and more vegetarian and vegan options. This dish was inspired by my boring 8 hours flight from Reykjavik to San Francisco with nothing else to read and no other distraction than my magazines and meditation books! Believe it or not this is an express dish that is ready in less than 30 minutes, so something to keep handy when you have unexpected guests. 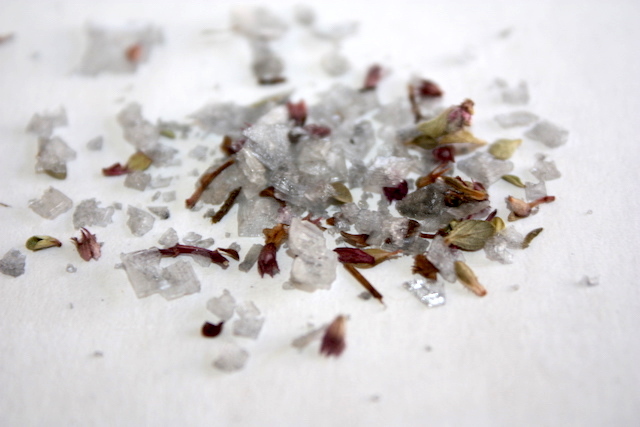 For the salt substitute you can use any grainy salt like fleur de sel or anything with a crunchy bite. The citrussy vinaigrette enhanced by ginger adds a wonderful touch to the zucchini. You will love this simple dish with bold yet smooth flavors. In a large tray, place yam slices and drizzle with olive salt, salt and pepper. Broil in the oven on both sides for about 10 minutes. The yams need to be tender but still firm, in order that they won’t break when handling them. Keep warm. In a mixing bowl, scoop avocado flesh and mash with a fork. Keep some texture and do not mash to thinly. Add onion, lime. Keep avocado oil and lava salt for the end to drizzle. 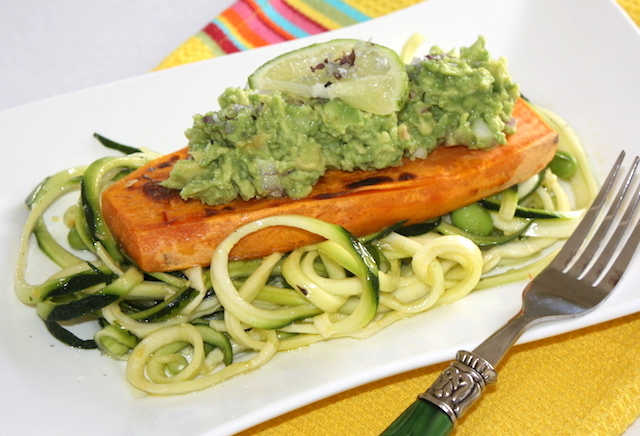 Form ribbons with zucchini using a spiral slicer or alternatively a julienne slicer, add edamame. In a mixing bowl, mix all vinaigrette ingredients. Pour vinaigrette on top of zucchini/edamame mixture and mix well. Place some zucchini ribbons on a plate. 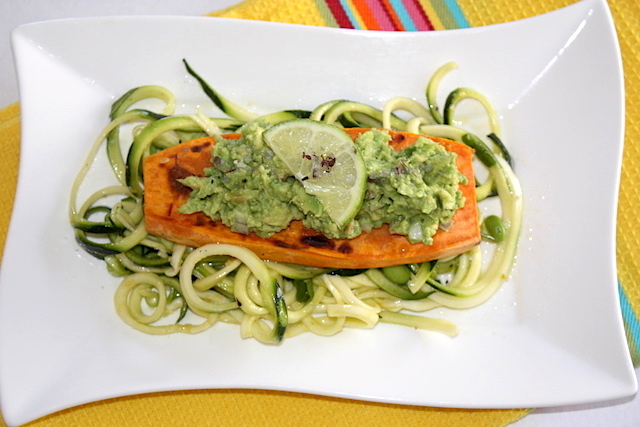 Add one slice of yams and top it with avocado mash. sprinkle with avocado oil and lava salt. This entry was posted by silvia on March 29, 2017 at 1:19 pm, and is filed under Express - Less than 30 minutes, Vegan. Follow any responses to this post through RSS 2.0.You can leave a response or trackback from your own site.